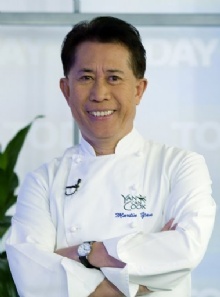 Martin Yan is a famous Celebrity from China, he is 70 years old and still alive, born December 22, 1948. Martin Yan (Chinese: 甄 文 达 - Chan Van Dat, later changed to 殷 文 达 - An Van Dat), born in 1948, is a chef-Americans United, the main character in the program cooking famous named Yan Can Cook. There he settled in Hillsborough, California, south of San Francisco. He married Susan ("Sue") and have two children, twin Choline and Devin. He is not related to items Wok with Yan cooking of a Canadian individual is Stephen Yan. Our collection contains 34 quotes who is written / told by Martin, under the main topic Food. "So when I do Chinese cooking, I mix everything together, then the kids have to eat their vegetables. They won't have the patience to pick them out"
"When you enjoy what you do, work becomes play"
"Why is America such a great country. It is because we stand united"
"You don't have to show people how successful you are"
"Well, you know, if you get into the profession because you think you can make a lot of money, you can never become successful"
"The problem with a lot of Chinese is that they put up divisions between Taiwanese, Hong Kong natives, mainlanders. We are never united. I really hope that the Chinese can be more united"
"The only thing that counts is if you know how to prepare your ingredients. Even if with the best and freshest ingredients in the world, if your dish is tasteless or burnt, it's ruined"
"The hoopla, the applause, the praises have never excited me"
"Soy sauce is really a multi-purpose seasoning"
"Some people never contribute anything positive to society, they may even drain our resources, but most of us try to do something better, to give back"
"People who don't travel cannot have a global view, all they see is what's in front of them. Those people cannot accept new things because all they know is where they live"
"Just like if you were brought up on a farm, you would most likely carry on your father's business as a farmer; I was brought up in the kitchen and ended up becoming a chef"
"In general I love to eat anything. I enjoy anything that is well prepared, a good spaghetti, lasagna, taco, steak, sushi, refried beans"
"If I could only have one type of food with me, I would bring soy sauce. The reason being that if I have soy sauce, I can flavor a lot of things"
"I've never considered myself a celebrity or even part of the entertainment business. I'm a cooking teacher"
"I think being famous is more of a hindrance, a constraint, than just letting yourself be free"
"I think a lot of times it's not money that's the primary motivation factor; it's the passion for your job and the professional and personal satisfaction that you get out of doing what you do that motivates you"
"I remember when I was in college, I used to watch Julia Child's cooking show during dinner and joke with my roommates about becoming a TV chef"
"I normally don't eat junk food"
"I live a very low-key life"
"I have a lot of cooking tools. In fact I have a whole drawer full of knives. Cooking tools, especially cutlery, are my toys"
"I enjoy the quiet life"
"I don't like to waste anything. Any food left over from the night before is always eaten the next day"
"I can represent my culture while helping not only the Chinese-American community, but also the community at large"
"I am just a normal professional with a great job and a great life"
"I also have a lot of preserved foods, things that will keep for a long time like dried fish, seaweed or lotus seed"
"Happiness is within. It has nothing to do with how much applause you get or how many people praise you. Happiness comes when you believe that you have done something truly meaningful"
"First of all, I can't really claim to be a great chef"
"Chinese culture has a lot of virtues that are tremendously valuable to not only us as Asian-Americans, but also the world in general"
"Because normally with Western cuisine, you'll serve vegetables separate from the meat, so kids will eat the meat and never touch the vegetables"
"At thirteen, when I arrived in Hong Kong after leaving China, I made a living by working in a restaurant"
"As long as the food is well prepared and not overdone, I think it tastes good. It doesn't matter if it's Chinese, Japanese, anything"
"Anyone that has come to America past the age of eighteen will be able to understand when I say that you can never shake your accent"
"A lot of people don't enjoy their job, they may even hate it, but I am lucky enough to be able to make a living through my passion"